For the American racing driver, see Jim Pace (racing driver). Although he was born in Little Rock, Arkansas, Pace was raised in Grand Rapids, Michigan. He played sandlot football with Terry Barr. In high school, Pace was a football and track star from 1950 to 1954. In track he ran a time of a 9.6 seconds in the 100 yard dash at Dunbar High School. ↑ "All-Time Player: James Pace". NFL Enterprises LLC. Retrieved 2007-11-27. 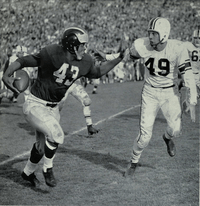 1 2 3 4 "University of Michigan Football All-American: James Pace". The Regents of the University of Michigan. 2007-02-10. Retrieved 2007-11-27. 1 2 3 4 "Jim Pace". Arkansas Sports Hall of Fame. 2002. Retrieved 2007-11-27. ↑ "1957 Football Team". The Regents of the University of Michigan. 2007-03-31. Retrieved 2007-11-27. ↑ "Tribune Silver Football winners, 1924-2005". The Chicago Tribune. 2007. Retrieved 2007-11-27. ↑ "Versus Ohio State November 23, 1957". Versus Ohio State November 23, 1957. 2003. Retrieved 2007-11-27. ↑ Bob Hoobnig (1955-12-02). "Swink On AP All-American". Abilene Reporter-News. ↑ "1958 NFL Player Draft". databaseFootball.com. databaseSports.com. 2006. Retrieved 2007-11-27.